Just 2 more days to Christmas and not sure where to celebrate Christmas Eve or the Big Day itself with your loved ones? 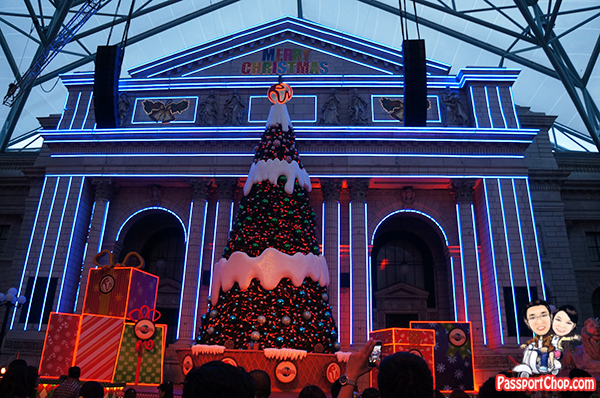 Why not consider Universal Studios Singapore? 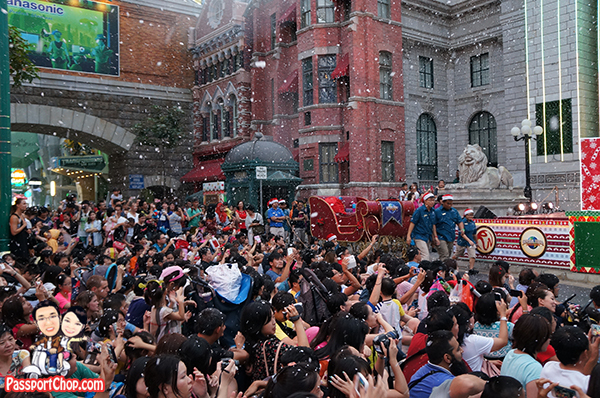 Of all the Christmas parties and events around Singapore (with their Christmas lightings or performances or even “snowfall” ~in the form of foam/bubbles), I felt that Universal Studios Singapore trumps them all as the theme park not only provides all of the above-mentioned entertainment plus you can actually have fun the whole day with all the attractions and rides and then more late into the evening as Universal Studios Singapore’s opening hours are extended till 10pm daily! Furthermore this December, visitors to Universal Studios Singapore will be able to meet the Minions from the DESPICABLE ME movie. There are no scheduled Meet and Greet timings with the Minions but they appear quite frequently (from what I have observed – at least 5-6 times daily) on the Hollywood Walk of Fame just in front of the distinctive red fire truck (very near the entrance to Universal Studios Singapore). 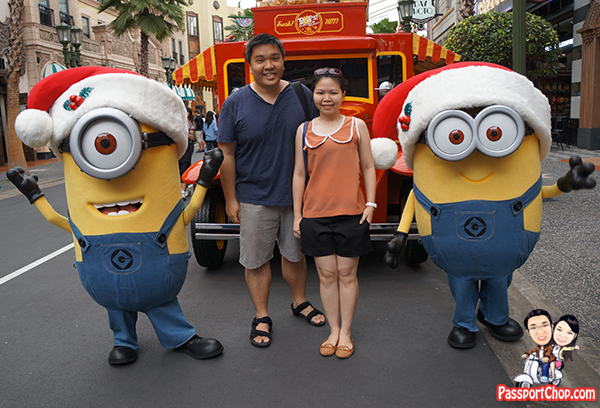 Expect long queues to take your photos with the Minions. 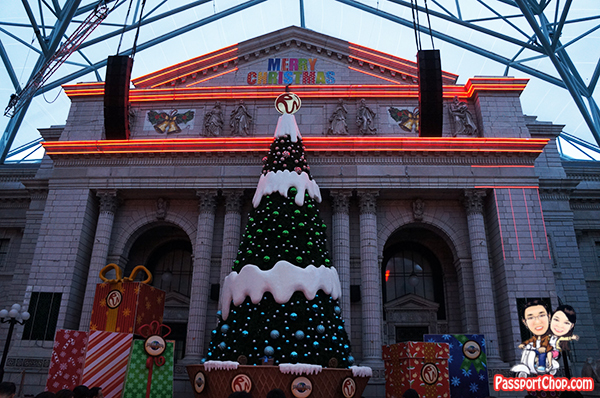 From 19 to 30 December, you can also experience snowfall over Universal Studios Singapore’s New York street and watch dancing lights at the facade of New York Public Library (just look out for the huge Christmas tree!) four times in the evening! When we were there on a Thursday, the scheduled timings for the Christmas Dancing Light Show and Snowfall on New York Street was held at 7pm, 7.30pm, 8.30pm and 9.50pm. As you can see from the timings, there is no need to rush to catch the shows; some attractions and street entertainment are still ongoing in the evenings so take your time to have fun at the park before checking out the snowfall and light show finale!). Grab a copy of the Universal Studios Singapore programme schedule (available at the entrance to Universal Studios Singapore) for the latest timings. 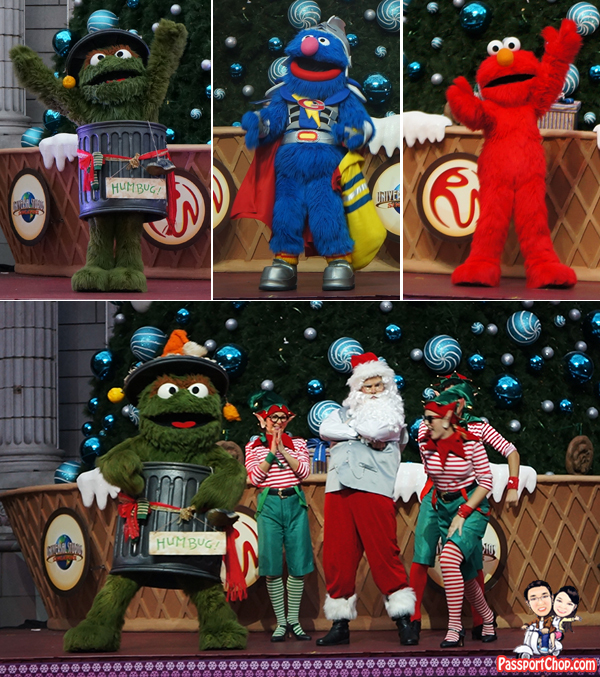 One of the Christmas highlights in Universal Studios Singapore is the Sesame Street Saves Christmas performance. 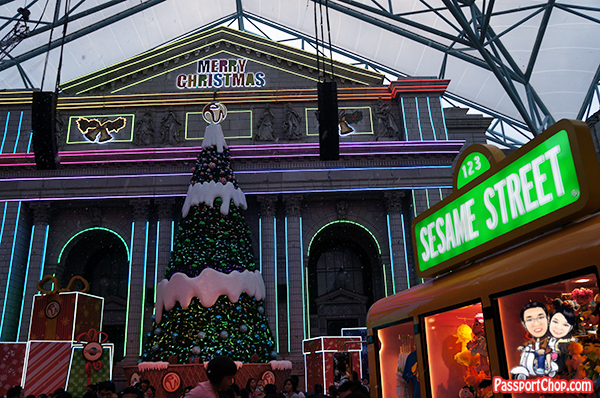 This is a 16-minute special edition of Universal Studios Singapore’s live Sesame Street show, featuring an original Christmas tale. It is held at the stage in front of the facade of New York Public Library and there are 3 nightly performances at the following timings (based on our visit – check programme schedule for latest timings) – 6.30pm, 8pm and 9.30pm. You can expect almost all of Sesame Street’s characters to show up at this performance from the “Me Loves Cookies” cookie monster (my personal favorite! 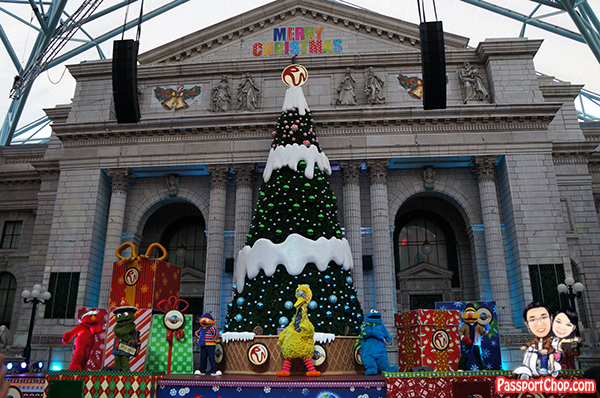 ), Oscar the Grouch, Big Bird to the crowd’s favorite – Elmo! There will be lots of singing and dancing – definitely a show that will engage your kids or the child at heart (like me – this definitely brings back fond memories of watching Sesame Street 10+ years ago!). There will also be a rapping Santa Claus and dancing elves so definitely lots to look forward to in this performance. For a good view of the performance, be sure to station yourself early in front of the stage as it will get really really crowded about 10 minutes before the show. 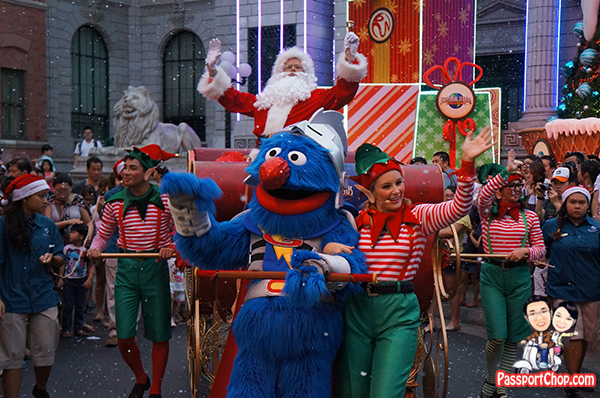 The performance will culminate into a Santa Claus parade along the New York street – if you are wondering what is Grover doing in that costume and pulling the sleigh – catch the Sesame Street Saves Christmas performance to find out for yourselves :-). Guests can then take photos with Santa during the scheduled Meet and Greet session with Santa Claus (at 7.10pm, 8.40pm and 10pm – timings subject to change; see programme schedule at time of visit). There will also be snowfall over New York street. 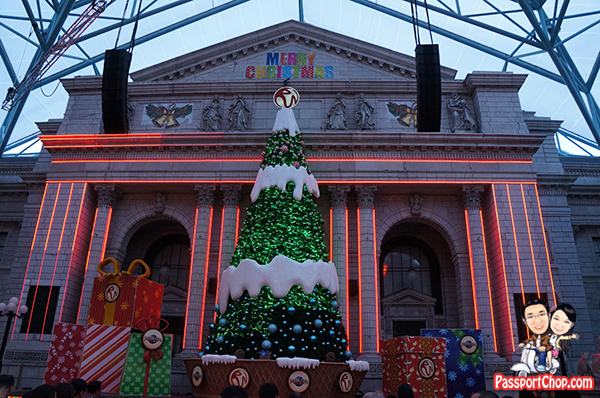 The snow, made of non-toxic snow foam, will fall seven times each night: for about five minutes after each live Sesame Street Saves Christmas show and another three to four-minute snowfall, will occur after the Christmas Dancing Lights show. So if you want to experience the snowfall with a very short interval in between, I recommend that you hang around New York street after the Sesame Street Saves Christmas performance and in about 10 minutes, you will see snowfall again after the Christmas Dancing Lights show (try for the 6.30pm (Sesame Street show);7pm (Dancing Lights show) or 8pm;8.30pm or the 9.30pm; 9.50pm timings – timings subject to change; check latest Universal Studios Singapore programme schedule). Basically, you can expect snowfalls on New York Street every 10 to 30 minutes between 6.30 and 10pm. The Dancing Light Show transforms the New York library facade into a stage where you see neon lightings of different colors being displayed on the facade synchronised with the music in the backdrop (as seen in the series of pictures below). Excellent blog here! And Merry Christmas! instead of that, this is fantаstic blog. A great read.